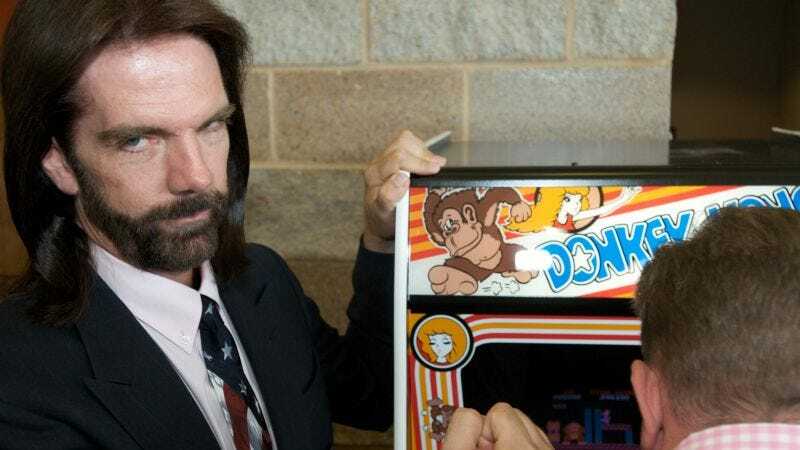 Last week, arcade game champion and hot sauce magnate Billy Mitchell was stripped of his prestigious Donkey Kong and Pac-Man high scores after an investigation determined that he hadn’t set his scores on original arcade machines—introducing the possibility that they had been totally faked. The governing body of the competitive arcade-gaming community, Iowa’s Twin Galaxies, banned Mitchell from submitting future high score claims and declared that it will no longer recognize him as the first person to break one million points in Donkey Kong. Fans of Seth Gordon’s documentary The King Of Kong saw the announcement as well-deserved vindication for Steve Wiebe, the lovable underdog score-chaser who saw his heroic attempts to make Donkey Kong history repeatedly (and suspiciously) thwarted by overtly villainous Mitchell in the film. The implication seems to be that what he did wasn’t against the rules at the time he did it, which seems kind of like an admission that it is at least against the rules now. That doesn’t exactly prove that he didn’t cheat, but Mitchell also offers a very Trumpian promise to eventually release a ton of evidence that will somehow prove he’s not a cheater, none of which he can even hint it until some mysterious future date.